We’d love your help. 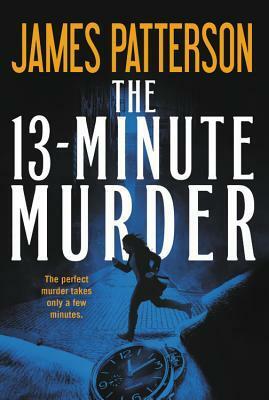 Let us know what’s wrong with this preview of The 13-Minute Murder by James Patterson. Sometimes it only takes a few minutes for the perfect murder to take place. Here are three fast-paced thrillers that will have you reading for just a minute longer. 13-MINUTE MURDER: He can kill anybody in just minutes--from the first approach to the clean escape. His skills have served him well, and he has a grand plan: to get out alive and spend his earnings with his belo Sometimes it only takes a few minutes for the perfect murder to take place. Here are three fast-paced thrillers that will have you reading for just a minute longer. To ask other readers questions about The 13-Minute Murder, please sign up. Note: This is a review solely of this short story, not the collection of three BookShots found in the published work bearing the same name. Please see the link for each of the other two stories individually, as they were read and reviewed previously, also independently. It is always nice to curl up with a BookShot to pass an hour or so, watching James Patterson and his c Note: This is a review solely of this short story, not the collection of three BookShots found in the published work bearing the same name. Please see the link for each of the other two stories individually, as they were read and reviewed previously, also independently. Matt Adrienne wrote: "Wonderful review. I like all his books because I know I will enjoy a story"
Beware this is three bookshots and not a standalone book. DEAD MAN RUNNING ⭐ ⭐⭐⭐ First story was very good. Could've been a full length book. Main character and suspense were good. 113 MINUTES ⭐⭐⭐⭐ I was going to give the second story 3 stars. The story didn't make sense, but the twist was good and explained it all. 13-MINUTE MURDER ⭐⭐⭐ Didn't like the story as much as the first two, but I liked the character, some humor...and I'm a sucker for dogs. A darker story. Beware this is three bookshots and not a standalone book. DEAD MAN RUNNING ⭐️ ⭐️⭐️⭐️ First story was very good. Could've been a full length book. Main character and suspense were good. 113 MINUTES ⭐️⭐️⭐️⭐️ I was going to give the second story 3 stars. The story didn't make sense, but the twist was good and explained it all. For all of Michael Ryan's planning-this murder really goes awry.He loses much more than he gains and learns a lot too.Does it pay off in the end?Or does he really disassociate that much?The question lingered in my mind a while after I finished the book. I don't care for the three separate stories. They feel rushed like they were stories in your head you didn't want to really develop so you threw it down on paper because. Actually 2 stories in this book. Neither one worth reading. I really enjoyed the first 2 stories. Was not a fan of the third story. Just wanted a quick read as I couldn't sleep last night. This was 3 short stories so read the 1st one and woke up and read the rest. Super quick read. This is a story collection. I am only reading the title story. Have previously read the other 2.